Asus ROG Crosshair VII Hero AMD X470 Chipset AM4 Socket Motherboard, 4 x DIMM, Max. 64GB, 1 x PS/2 keyboard/mouse combo port(s), 1 x LAN (RJ45) port(s), 2 x USB 2.0 (one port can be switched to USB BIOS Flashback), 1 x Optical S/PDIF out, 1 x Clear CMOS button(s), 1 x USB BIOS Flashback Button(s), 5 x Gold-plated audio jacks, 8 x USB 3.1 Gen 1 (blue), 1 x USB 3.1 Gen 2 (red)Type-A, 1 x USB 3.1 (black)USB Type-C, 2 x Aura Addressable Strip Header(s), 2 x RGB Header(s), 1 x USB 2.0 connector(s) support(s) additional 2 USB 2.0 port(s), 1 x M.2 Socket 3 with M key, type 2242/2260/2280/22110 storage devices support (SATA & PCIE 3.0 x 4 mode), 1 x M.2 Socket 3 with M key, type 2242/2260/2280 storage devices support (PCIE 3.0 x 4 mode), 6 x SATA 6Gb/s connector(s), 1 x CPU Fan connector(s), 1 x CPU OPT Fan connector(s), 3 x Chassis Fan connector(s), 1 x AIO_PUMP connector, 1 x H_AMP fan connector, 1 x W_PUMP+ connector, 1 x 8-pin EATX 12 V Power connector, 1 x 4-pin EATX 12 V_1 Power connector(s), 1 x 24-pin EATX Power connector(s), 1 x Front panel audio connector(s) (AAFP), 1 x 5-pin EXT_FAN(Extension Fan) connector, 1 x Slow Mode switch(es), 1 x Thermal sensor connector(s), 1 x Reset button(s), 1 x LN2 Mode switch(es), 1 x ROG extension (ROG_EXT) header(s), 1 x Safe Boot button, 1 x ReTry button, 1 x Slow Mode jumper(s), 1 x System panel connector, 1 x W_IN header, 1 x W_OUT header, 1 x W_OUT header, 1 x W_FLOW header, 1 x Start button, 1 x USB 3.1 Gen 2 front panel connector, 1 x Speaker connector, 1 x USB 3.1 Gen 1 connector(s) support(s) additional 2 USB 3.1 Gen 1 port(s), 1 x USB 2.0 connector(s) support(s) additional 2 USB 2.0 port(s), ATX Form Factor, 30.5 cm x 24.4 cm Copyright © 2019 ComXpert International CC - COPYING IS ONLY ALLOWED FOR THE PURPOSE OF SENDING US ENQUIRIES. E&OE. ASUS Aura has evolved to be more user-friendly than ever, Aura now supports RGB color codes, for easier setup, Customizable temperature thresholds allow you to choose how CPU and GPU temps are expressed via RGB lighting. AM4 socket for AMD Ryzen 2nd Generation/ Ryzen with Radeon Vega Graphics/ Ryzen 1st Generation/ 7th Generation A Series/ Athlon X4 processors. The best price and guaranteed service and backup from official computer suppliers in South Africa for the MB-AX470C7H Asus ROG Crosshair VII Hero AMD X470 Chipset AM4 Socket Motherboard. 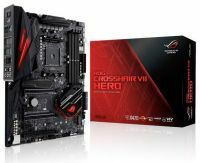 The Asus MB-AX470C7H Asus ROG Crosshair VII Hero AMD X470 Chipset AM4 Socket Motherboard is available for R5255. The product is sold by ComX Computers as new. Prices are valid today 2019-04-22 (before 2019-04-23 , by quote, while stocks last). The product is expected to be in stock, although this is not guaranteed. Find related MB-AX470C7H Asus ROG Crosshair VII Hero AMD X470 Chipset AM4 Socket Motherboard products in our Motherboards: AMD socket AM4 Motherboard Category for even more options. Read reviews and find out about MB-AX470C7H Asus ROG Crosshair VII Hero AMD X470 Chipset AM4 Socket Motherboard. Discounts, specials and cheap prices only at ComX Computers.